Wetland features from MassDEP including open water, marshes, swamps, tidal flats, etc. 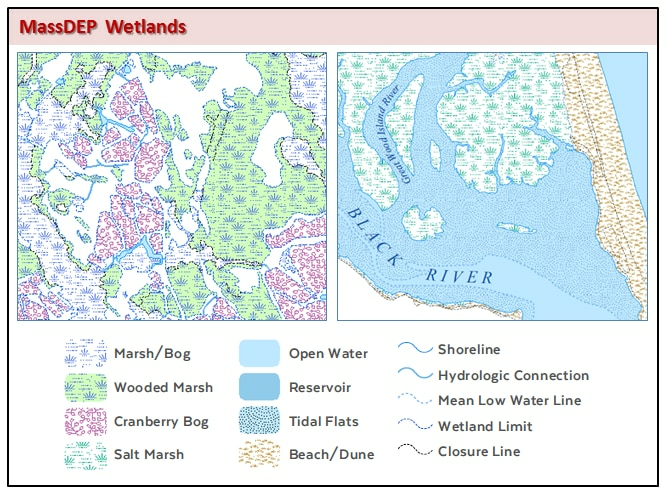 The WETLANDSDEP_POLY layer contains polygon features delineating mapped wetland resource areas and attribute codes indicating wetland type. The WETLANDSDEP_ARC layer was generated from the polygon features and contains arc attribute coding based on the adjacent polygons as well as arcs defined as hydrologic connections. Together these statewide layers enhance and replace the original MassDEP wetlands layers, formerly known as DEP Wetlands (1:12,000). That original MassDEP wetlands layer is still available for reference. The 2005 MassDEP Wetlands layers provide a medium-scale representation of the wetland areas of the state and are for planning purposes only. The wetlands boundaries shown on this map have been determined by photographic interpretation. They do not represent, and should not be used as, wetlands delineations under the Massachusetts Wetlands Protection Act (M.G.L. c. 131 §40) and its regulations. Wetlands boundary determination for other purposes, such as the Wetlands Protection Act MA Act M.G.L. c. 131 or local bylaws must use the relevant procedures and criteria. The original MassDEP wetlands mapping project was based on the photo-interpretation of 1:12,000 stereo color-infrared (CIR) photography, captured between 1990 and 2000, and included field verification by the MassDEP Wetlands Conservancy Program (WCP). In 2007 the MassDEP WCP began a statewide effort to assess and, where necessary, update the original wetlands data. The MassDEP WCP used ESRI ArcGIS Desktop software, assisted by the PurVIEW Stereo Viewing extension, to evaluate and update the original wetlands features based on photo-interpretation of 0.5m (1:5,000) digital stereo CIR imagery statewide, captured in April 2005. No field verification was conducted on this updated 2005 wetlands data. The 2005 WETLANDSDEP_POLY layer includes polygon features that distinguish it from its predecessor by overall changes in size and shape. In addition, new polygons have been created and original ones deleted. Many of the polygons, however, remain the same as in the original layer. All changes have been made according to the techniques described below. For the purpose of cartographic continuity, a small number of coastal polygons outside the state boundary were added based on data provided by the United States Geological Survey (USGS) and the National Oceanic and Atmospheric Administration (NOAA). 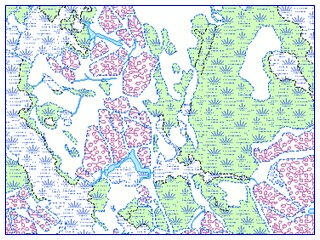 The 2005 WETLANDSDEP_ARC layer was generated to support map display and was designed to cartographically enhance the rendering of wetland features on a base map. Arc features in this layer were generated from the wetland polygons and coding (ARC_CODE) was assigned based on the adjacent polygon types. Hydrologic connection features (ARC_CODE = 7) were then added. Where delineated, these arc features indicate an observed hydrologic connection to or between wetland polygons. Although efforts were made to be comprehensive and thorough in mapping hydrologic connections, due to the limitations of aerial photo-interpretation some areas may have been missed. The types of updates made to the original wetland features include alteration, movement/realignment and reclassification. In some cases original wetland areas have been deleted and new areas have been added. Updates to original wetland features resulted from the following factors: changes in the natural environment due to human activity or natural causes; advances in the field of remote sensing, allowing for more refined mapping. Deletion of original wetland or hydrologic connection features due to changes in wetlands environment or inconsistency with mapping criteria. Features that are inconsistent with the mapping criteria include isolated wetlands that are are less than ¼ acre in size and hydrologic features that do not connect to wetland polygons. Please note that although efforts were made to be comprehensive and thorough in the evaluation and mapping of statewide wetland resources some areas of the state may have been missed. Many of the wetland and hydrologic connection features remain the same as in the original data. The polygon attribute SOURCE_SCALE may be used to identify areas that have been altered from the original wetlands. SOURCE_SCALE code 5000 indicates an updated wetland area. SOURCE_SCALE code 12000 indicates an unaltered, original wetland polygon. NOTE: A closure line is defined as a boundary between similar, but different types of wetland resource areas. As an example, polygons with a POLY_CODE of 2 (marsh) or 3 (wooded swamp) are considered to be similar wetland resource types so the lines between these features are coded as closure lines and not as a wetland limit. 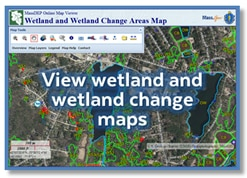 The MassDEP Wetlands data were developed by the MassDEP Wetland Conservancy Program. For questions call 617-556-1163.